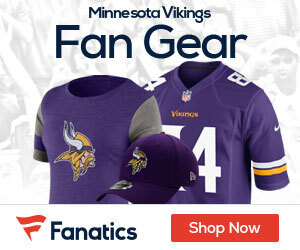 « Come Meet Christian Ponder At Champs Thursday Night! Last season Adrian Peterson rushed for 2097 yards. This came courtesy of the ridiculous rate of 6.03 yards per carry. Absolutely Awesome ! Thank you Adrian from the bottom of my purple bleeding heart ! Now, what are you gonna do for us this year ? It seems ungrateful, But In this “What have you done for me lately” environment known as the NFL, this is what many fans across the nation are asking themselves. This mentality has me scratching my ear over this. It begs the question “When in pro sports history, has a player followed a season of this magnitude with an even better year? ” As I “Ponder” (ok, that was bad!) my last question, I cannot seem to recall a single example. It is in this spirit that this writer feels that fans may be setting themselves up for a let down…..of sorts. Hey ! Planet Earth to everyone ! 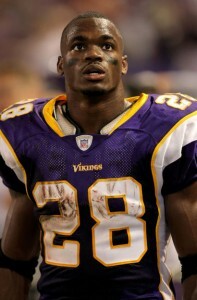 Adrian Peterson is (believe it or not) a mere mortal ! It may be difficult to work your brain around the concept, but the man is human! An incredibly gifted human being in terms of athleticism, but a human none the less. There is no Titanium armor plating encasing this “Beast”. We all found that out a little over a year ago when he injured and then incomprehensibly recovered to the point of participating in drills from both a torn anterior cruciate ligament (ACL) and medial collateral ligament (MCL) within a time period of just under nine months. NINE MONTHS !!! My daughter had the very same injury and was still walking with a limp eighteen months later. She never participated in high school varsity basketball again. Granted, My Taylor didn’t have Dr. James Andrews, the renowned surgeon making the incision, nor was she granted access to the the same world class physical therapy and rehab services that Peterson had, but her surgeon was incredibly talented and she got first class attention. I am getting off topic, but my point is that Adrian Peterson by no means represents the norm, and athletes sustaining similar injuries in the future will almost certainly not be able to follow in his footsteps. What’s more, athletes at the youth, high school and collegiate levels should not view professional athlete recovery times as a standard on which to base their own. That’s an important reminder for fans, and for the players themselves: A player who pushes himself to come back on Peterson’s timetable is probably going to do more harm than good. Going from ACL to MVP will always be the exception, not the rule. 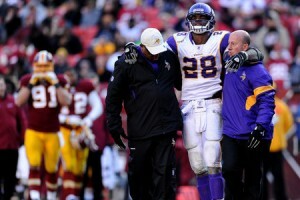 By last August, Peterson was participating in pre-season games. Look at the game film, Clearly he was a step slower then before. In addition, when he would plant his foot to cut, there was noticeable bend and lack of strength. Not unexpected, as previously stated, he’s human ! Through the first six regular season games, AP still lacked the explosiveness and sudden burst of his pre-injury form. In that span, he carried the ball 113 times for a total of 499 yards and an average of 4.41 yards per carry. Not bad for almost anyone NOT named Adrian Peterson. However, from game seven on, something else altogether began to emerge. After averaging 83.16 yards per game over the first half dozen contests, Peterson carried the ball 235 times for a total of 1,598 yards at 6.8 per. In games seven through sixteen the back ran at an amazing clip of 159.8 yards per game. That’s a pretty drastic difference. It may be that it took that long to be 100% healthy, or perhaps he finally got past the psychological hurde of trusting his body in order to run with the reckless abandon of pre-injury AP. In all likelyhood, it was a combination of both along with a myriad of other variables that fueled this historic ten game stretch. Whatever the case, the point is that from week seven on, Superman put his team on his back and took us all on a historic ride, shattering every meaningful Viking rushing record and surpassing any season that any running back not name Dickerson has ever produced, along the way. This brings me to my point….. What about this year? Is it fair to expect Peterson to produce anything close to what he accomplished last season? Look for Part 2 of 2 to be posted on Vikingsgab in the next day or two. I think he can achieve his goal of 2500. High water marks are set at different times, and Peterson is primed and ready to do it, as is the Vikings offense. They’re planning on it. If he can take up where he left off last year, and he’s 100%, if we can continue to build the pass opportunities, he could explode even more. Very possible. He’s going to need this kind of yardage to catch Emmit Smith, and to keep it up. Wouldn’t you expect he would pass Smith?